Tuberculosis is the leading cause of death among people living with HIV, and according to UNAIDS, almost 60% of the estimated global HIV-related TB cases are not diagnosed and not treated. 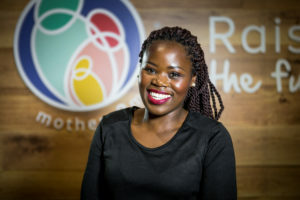 One of our Mentor Mothers experienced this danger firsthand—Relebohile Leoatha from Lesotho was sick for three years before she was diagnosed with tuberculosis. We asked her to share her story in this special blog for World Tuberculosis Day on 24 March. In 2006, at just 15 years old, I fell pregnant. My mother told me I had to go to the clinic to see if my baby was doing well. I was advised to take an HIV test and was shocked when they told me I was positive. It was hard to tell my family but I eventually plucked up the courage. I didn’t really know what it meant but I was sure I would die… and so would my baby. I went to the clinic and although I did not understand everything the nurses told me, I took the treatment to protect my baby from infection and my daughter was born free of HIV. In 2008, I started getting sick. I had lost weight and was coughing a lot. I went back to the clinic but was diagnosed each time with a different illness and the medication did not help. My tuberculosis (TB) tests also came back negative. I even went to South Africa to see a doctor, who diagnosed me with ulcers but I was still not getting better. It was very hard to keep going to school because my peers were avoiding me. On the days I missed school to go to the clinic, no one wanted to help me catch up with the schoolwork I missed, not even the teachers. I had to send my daughter to my mother’s house because I could no longer take care of her. My illness was preventing me from living a normal life. In 2011, after three years, a TB test came back positive. I was started on treatment immediately and was educated about possible side effects but was very lucky not to have any. Finding out I had TB was a relief to me. Finally, I was going to get better and indeed I did! My family was thrilled too because they had spent a lot of money and time taking me from doctor-to-doctor, clinic-to-clinic, and had almost lost hope I would recover. Everyone in the family had to be tested too and one of my sisters, who was the main person who took care of me, was also diagnosed with TB. Fortunately, my daughter’s tests came back negative and she was given INH, a pill that would prevent her from contracting TB. Taking just four pills a day for six months was easy for me—it was a lot easier than being sick for three years and taking medication that did not help. After just six months, I was cured. When the nurses did the TB tests again, the results came back negative. Today, I work as a Mentor Mother with mothers2mothers, an NGO that employs HIV-positive women as community healthcare workers. As part of my work, I educate other women about the signs and symptoms of TB. I do a prescreening with them to find out if they have any of the signs and refer them for care. I keep reminding them to come to the clinic right away if they experience any of the symptoms. I remind those who are diagnosed with TB about how lucky they are to be in the know. TB is curable but it kills when it’s not treated. It was pure luck that I lived that long without treatment. I know my work is important— TB is the leading cause of death among people living with HIV because of their weakened immune systems. According to UNAIDS, in 2016 alone, an estimated 5,200 people living with HIV died due to TB-related complications in Lesotho. That amounts to over half of the country’s AIDS-related deaths (total estimated at 9,900 in 2016). 37% of people on ARVs were also being treated for TB in Lesotho. So I can’t do my work to fight HIV without fighting TB… and I am pleased to say I am making progress against both!